Celebration Wine Tours for groups of 9 or more. Live it up with Gusto Wine Tours! 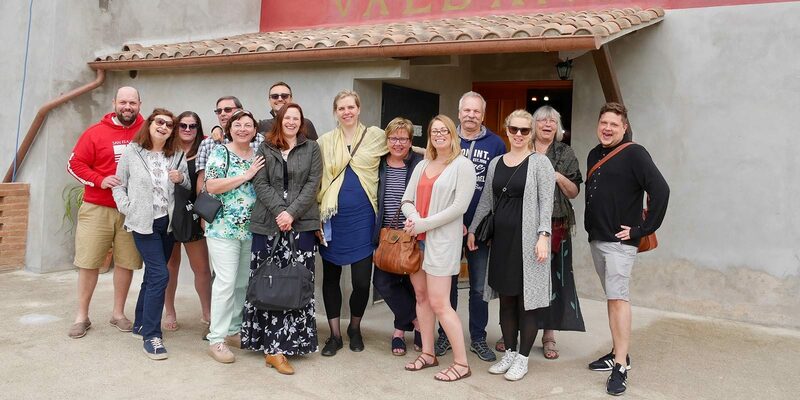 Come and join us at Gusto Wine Tours for one of our fabulous Celebration Wine Tours! Whatever the occasion, be it a milestone Birthday, your Wedding or a special Anniversary. Any reason to try the delicious Umbrian wines really! Fun in the sunny Umbrian vines. Come and enjoy a memorable and fun day of wine-tasting in the beautiful Montefalco area of Umbria, Italy. We have crafted an exclusive, tailor-made, private wine tour with collection from your accommodation in a comfortable, air-conditioned coach with a dedicated driver. You’ll sit back, relax and drink in(!) the passing Umbrian countryside as you are driven from vineyard to vineyard. 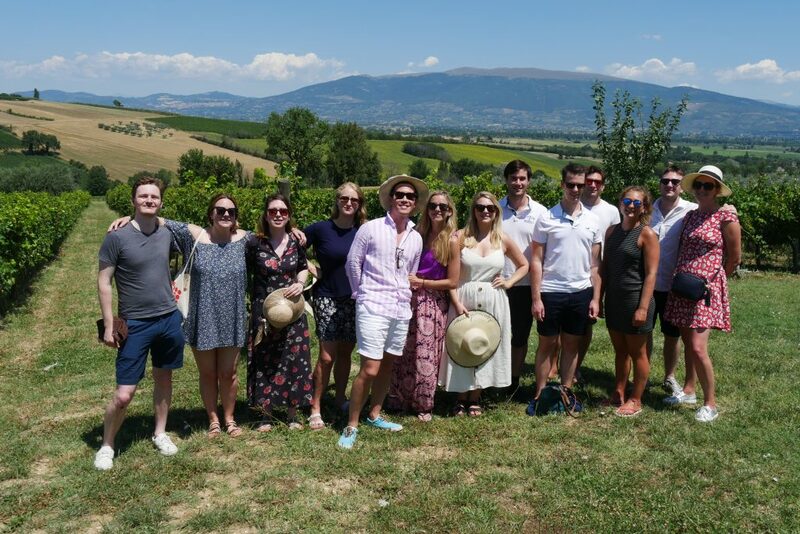 You will experience entertaining guided visits to family-run vineyards where you will taste the range of fabulous Montefalco wines accompanied by delicious homemade snacks on these exclusive Celebration Wine Tours. Above all, get to know these extraordinary Umbrian wines, usually proudly served by the winemaker himself! It goes without saying that you will have a truly unique and memorable day. * As the wineries are family-run, sometimes they may not be available for lunches – in this case, you will enjoy a wonderful 4-course lunch with wine at a stunning local agriturismo in the Umbrian countryside. Start Making Plans for your Celebration Wine Tours! We operate all year round, so check for availability and a quote today! The prices start as low as €95.00 per person for larger all day group tours. 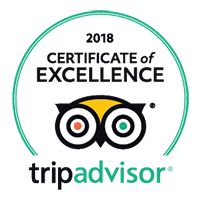 Check out our fantastic reviews on Trip Advisor! J.C. UK – Just had the most amazing time! Firstly, I can’t say enough about the day we spent with Mark of Gusto tours. 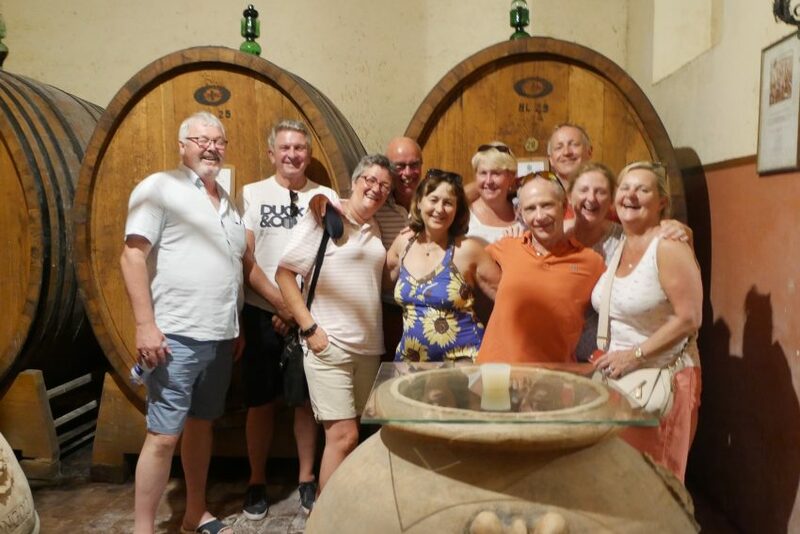 My family and I spent a week in Umbria in mid August and booked this tour with Giselle of Gusto via email, she was so informative and accommodating. We were a party of 10 and she recommended the perfect tour that included transport, all the wine tastings and lunch – a very lovely lunch! Secondly, Mark was so so knowledgable about the area, the people, and of course the wine of Umbria. Mark was very engaging, and I for one learned quite a bit from him that day. Gusto does it all. They provide all I mention above AND can ship the wine you buy right to your home. (Some restrictions may apply). In conclusion, don’t hesitate to book a tour with Gusto. The tour was a wonderful way for my family and I begin our stay in Umbria . I hope to return to Umbria sooner rather than later and when I do, I will contact Gusto to take another one of their fantastic wine tours. Come and have a fun wine tour and celebrate with Gusto! Previous Post: « #ItalianFWT – Sagrantino For The Win(e).